They are filled with hate. So, as Christians, how do we respond? We see this loving attitude throughout Scripture. We see it with Jesus. 1. It all starts with the truth. Our positions and beliefs need to be in accordance with Scripture. We believe in objective truth, not relativism. There is right. There is wrong. We operate our beliefs – political and religious – based on a Christian worldview. 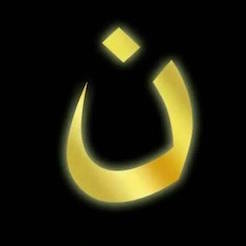 As Christians, we have a different response than the world’s anger and hate. We must speak truth, not half-truths, not emotions. As follower of the One who is the Truth (John 14:6), we are commanded to “speak the truth to one another” (Zechariah 8:16). As followers of the One who is love (1 John 4:8), we are commanded to do so “in love” (Ephesians 4:15). And as followers of the “King of kings and Lord of lords” (Revelation 19:16), we are commanded to respect those in authority (Romans 13: 1) while serving our highest authority (Acts 4:19-20). 2. We see others as God sees them. When we start our beliefs, words and actions based on truth, justice and compassion, we must treat those who oppose or oppress us as people created in the image of God. They are inherently valuable. They are loved by God. We must show compassion and love, despite what they say or do. 3. 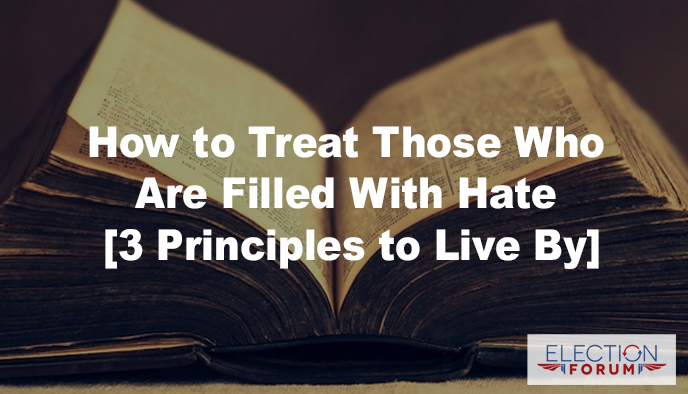 Your reaction to hate – the love of Jesus. This changes our words and actions towards those who oppose us. Don’t return hate for hate. We just know they desperately need Jesus. It makes you a true ambassador for Christ. Hi Craig – I see 3 principles, but they are numbered 1, 3, 4 . . .
Julie, I think the answer is that the devil is working overtime right now, and turning as many people as possible to hate. And especially hate Christians. The Ultimate battle is in heaven, with God fighting the devil, to get people on one side or the other. I used to be an atheist/agnostic until I was 44 years old, and then my spiritual eyes were opened, Thank God. So many so-called “Christians” don’t believe that the devil exists. But if a person believes the Bible and that God exists, they have to believe THE WHOLE BIBLE; not just “pick and choose” Scriptures they like or don’t like. That’s what so many cults/religions do to the Bible. I hope this helps a little, Julie. Keep the faith and keep praying. I once tried to “lovingly admonish” a sister Christian by giving her the Scriptures that should have opened her eyes to the Truth (regarding her support of gay ‘marriage’), & she came at me with “Judge not, Lest Ye be Judged” – I wasn’t judging, but she was omitting the truth from scripture so she could have “one foot in the world & one foot in the Word”, which we just cannot do! 🙁 People pleasers, compromising Christians, how do we help (other than always praying for them!)??? Actually, you were ‘judging’ – and doing so biblically. The actual problem being the person who abused scriptures warning you not to judge in order to silence you – as if Christians are never to judge, which would preclude Christians from opposing evildoers and from participating in juries in our nation’s judicial system. This relates to one of the best known and most abused scriptures used to silence meaningful dialogue. Which is “Judge not” (Matthew 7:1). But examine the entire passage: “Judge not, that ye be not judged. For with what judgment ye judge, ye shall be judged: and with what measure ye mete, it shall be measured to you again. And why beholdest thou the mote that is in thy brother’s eye, but considerest not the beam that is in thine own eye? Or how wilt thou say to thy brother, Let me pull out the mote out of thine eye; and, behold, a beam is in thine own eye? Thou hypocrite, first cast out the beam out of thine own eye; and then shalt thou see clearly to cast out the mote out of thy brother’s eye” (Matthew 7:1-5). Read this again carefully. Notice that it is addressed to a hypocrite! Not to those who sincerely want to discern whether a teacher, teaching, or use of scriptures is true or false according to the original-intent of God’s Word. And instead of being a prohibition against honest ‘judgment,’ it is a solemn warning against hypocritical judgment. Many who piously quote, “Judge not,” out of its context, in order to defend that which is false to God’s Word or silence speech they don’t like, do not see their own inconsistency in thus judging those who would obey God’s Word about judging that which is untrue to the Bible. The reason the church of Christ is today paralyzed by biblical editing is because Christians have not obeyed the commands of God’s Word to judge and put away and separate from false teachers and false teaching when they first appeared in their midst. Physical health is maintained by separation from disease germs. Spiritual health is maintained by separation from germs of false doctrine. The greatest peril of our day is not too much judging, but too little judging of spiritual falsehood. God wants His children to judge like the noble Bereans who “searched the Scriptures daily, whether those things were so”(Acts 17:11) – but not hypocritically like the pharisees. Mel, you are right. Matthew 7:1-5 is written to hypocritical judges. John 7:24 shows Jesus saying, “Do not judge according to appearance, but judge with righteous judgment.” So we ARE to judge, but judge “with righteous judgment.” There is Scripture that says we are not to judge the world, but we can judge the church. Lukewarm Christians don’t want to be shown their hypocrisy. I’ve seen it over and over. You are correct in saying that, “…we are commanded to respect those in authority (Romans 13: 1) while serving our highest authority (Acts 4:19-20). That said, one thing I have learned is to never reference Romans chapter 13 verses 1 or 2 without referencing versus 3 and 4 which place ‘qualifiers/assumptions’ on verses 1 & 2. Romans 13:3-4: For rulers are not a terror to good works, but to evil [to be qualified as a ‘ruler’ ordained by God in authority over Christians, government cannot be a ‘terror to good works, but to evil’ – otherwise, the submission called for in verses 1 and 2 does not apply]. Do you want to be unafraid of the authority? Do what is good [biblically defined good – not governmentally defined ‘good’], and you will have praise from the same. 4 For he is God’s minister to you for good [biblically defined good – which is not engaged in inherently because someone is in a position of governmental authority.]. But if you do evil, be afraid [biblically defined evil – not governmentally defined ‘evil’]; for he does not bear the sword in vain [God ordained government will NOT use governmental powers (bear the sword) inconsistent with biblically defined principals]; for he is God’s minister, an avenger to execute wrath on him who practices evil [meaning, if government ‘executes wrath’ on those practicing anything other than biblically defined evil, such authority is not ordained by God.]. Add to the above verses, other verses in the Bible making clear the Christians obligation to lovingly oppose evildoers, and we see the full perspective on the synergy of Christian obligation to submit to God ordained government and the obligation to oppose evildoers. Which, among other things, is required for a nation survival. This first became an issue for me after being asked to research America’s change from an erratic-trajectory toward prosperity pre-1900s, and Americas subsequent trajectory toward national-suicide beginning in the early 1900s and culminating in our existing God offending nation whereby even the GOP offers Christians little more then the opportunity to continually vote for ‘the lesser of two evils’ compared to Democrats. Part of this research involved reading many pre-1900s sermans justifying rebellion against British tyrants in authority over the 13 Colonies and subsequent church sermons justifying the fight to end slavery. The pre-1900s sermons justifying the fight against British tyrants and slavery were compared to modern day sermons where reminders of the Christians obligation to represent Christ in society and government to the exclusion of evildoers is lukewarm at best. What this research on the change in Christian teachings from 1620-2017 exposed was that while the original intent of God’s word is the same then, now, and forever, it has become increasingly edited throughout time to exclude the ‘works requirement’ of Christians warned about 7 times in James 2:14-26, and other places in the Bible. Worse yet, 1900s American Christianity increasingly experiences a fixation on that which ‘Christians receive from Christ’ at the expense of true faith necessarily producing ‘works’ glorifying Christ. Something negating a primary purpose of human creation, which is to except Christ as Savior, out of which true faith catalyzes an insatiable desire to engaging in works glorifying Christ. The pre-1900s sermons calling for opposition to British tyrants and slavery, along with other evidence, made clear that while Christians provided the vast majority of representation in society and government pre-1900s catalyzing the fight to expel British tyrants and to end slavery maintaining America on and imperfect trajectory toward prosperity, America’s trajectory changed in the early 1900s. This, as the pulpits of America began ‘editing God’s Word through omission’ regarding the Christian’s obligation to represent Christ in society and government to the exclusion of God offending Worldviews, lifestyles, and governance. In other words, America is destroyed by a Christ void created by lukewarm Christianity’s failure to represent Christ in society and government which is necessary for America’s survival. All of which must play into satisfying the biblical requirements regarding how to lovingly treat those hating and endangering Christians as individuals, and as citizens of this constitutional-republic.